If anyone wants to go out on a double date next week let me know. We are thinking Thursday night. In addition to Passover starting on Friday, Easter will be on Sunday. Passover and Easter normally fall very close to each other. Which is why I have a tradition of taking one of the hardboiled eggs I make to decorate for Easter and leave it plain to use on the Seder plate. Sacrilegious? Possibly. Convenient? Definitely. Sorry, where was I? Ah, yes. We were watching TV. And we were watching it on On Demand, so we were forced lucky enough to watch some commercials (as some one who worked in advertising before becoming a Trophy Wife, I am morally obligated to say commercials are great) and we saw one for Rice Krispies. 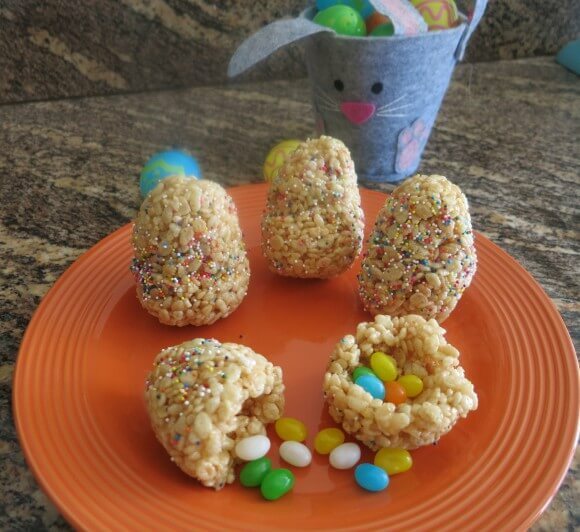 The commercial showed making Rice Krispie Easter eggs, and filling them with M&Ms. I loved it and decided to make them. Score one for advertising! We are having an egg hunt and picnic on the beach with some friends to celebrate Easter, so I will bring them to that. 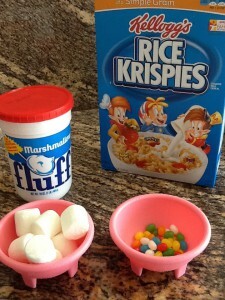 Which means I substituted jelly beans for the M&Ms, as I didnâ€™t want to risk them melting while we played in the water. I also used a combo of marshmallows and marshmallow fluff, as I had some leftover from the Marshmallow Fruit Dip. They were super easy to make. Just make sure to really fill the plastic eggs with the cereal, as it makes it easier to mold them into sturdy eggs. 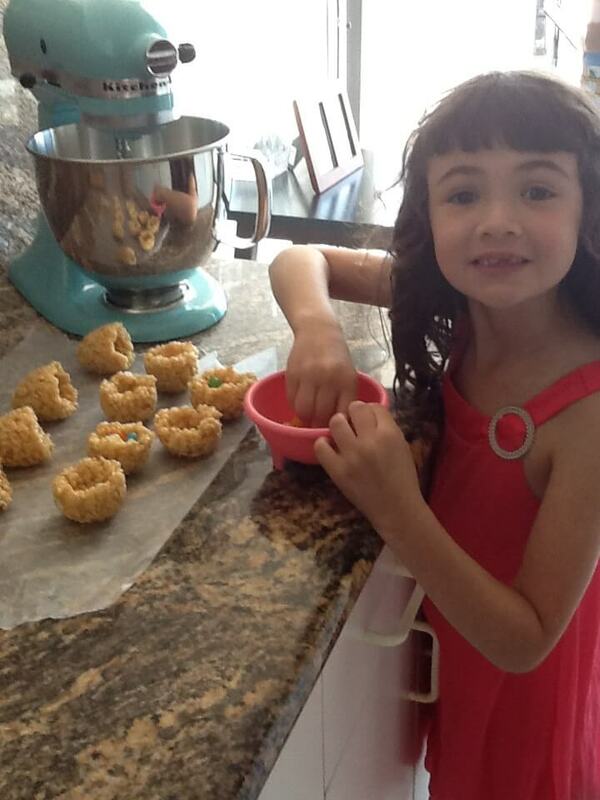 Averi had a really good time helping me make them. Especially since I let her eat the mixture that was stuck on the spoon and dip a marshmallow into the sprinkle decorations. They turned out so cute. And theyÂ will tide us over till after Easter, when I buy the chocolate covered peeps on sale for 75% off. Melt butter in a saucepan. 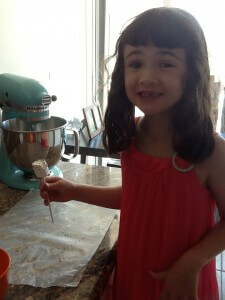 Add marshmallows, and melt down, stirring constantly. Remove from heat, and add in cereal. Mix thoroughly, so all cereal is coated. 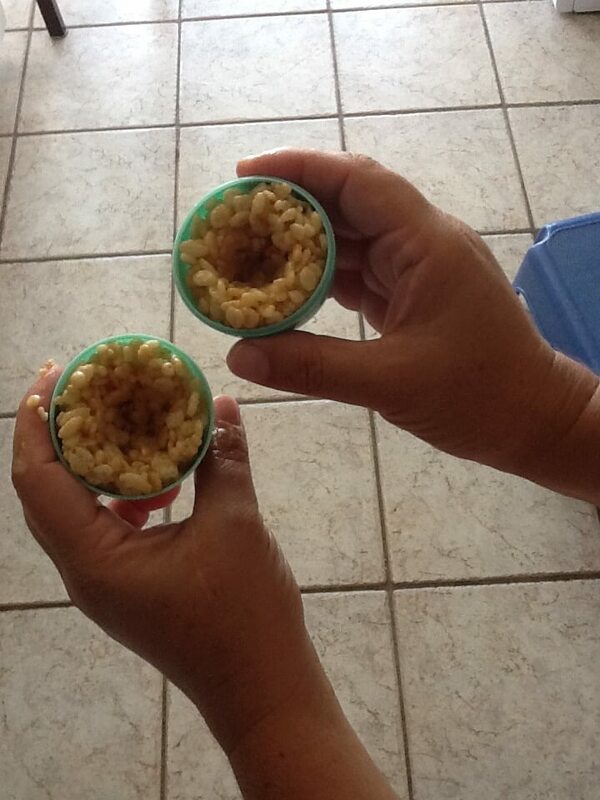 Fill the plastic eggs with cereal, making sure to completely fill it. Using fingers, shape the cereal into the egg shape, creating an indent in middle, which you will fill with candy later. Place the filled eggs aside, and let the mixture begin to harden. After five minutes, remove the cereal eggs, and place on waxing paper to continue hardening. If they are not holding the egg shape yet, return them to egg and let sit for another couple minutes. 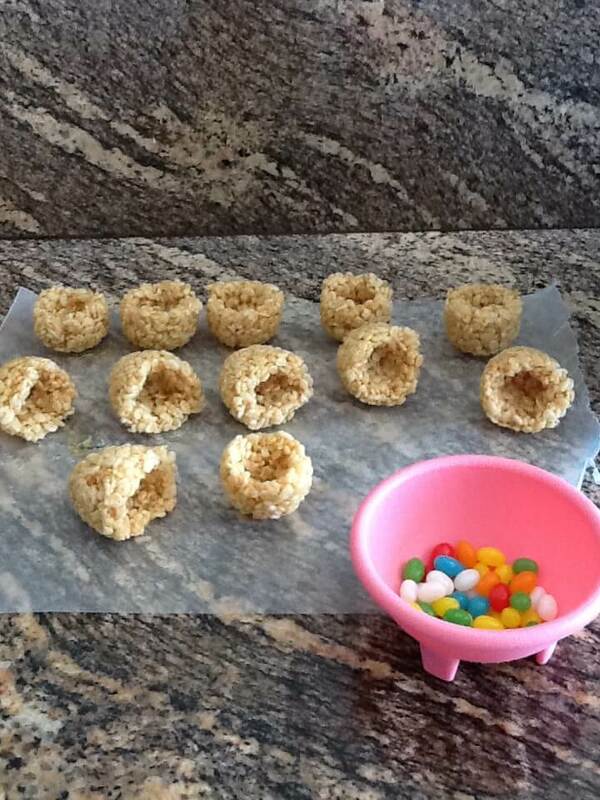 Once set and cooled, fill with candy. Then place the egg halves together, using your fingers to seal the halves and reshape the egg as needed.